The Screaming Pope: PhD in Brolliology? 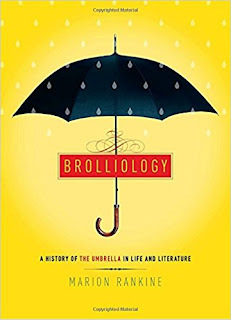 Ever heard of brolliology? It's describes the interest in objects employed to shield people from the weather and is used by Marion Rankine in her tome, Brolliology: A History of the Umbrella in Life and Literature. In her review of the book (“Potential to Flower,” TLS, 12/22 &12/29/17), Shahidha Bari remarks, “Who hasn’t cast a skeptical look through the window and seized that bundle of crumpled nylon and metal at the door? It is...one of those objects which anthropomorphize our anxieties, an external manifestation of our interior lives.” The question of whether or not to bring an umbrella certainly is an expression of existential dread, but often not of an anticipated shower or even downpour but of an extra appendage, an extra piece of weight in an age in which many people already feel weighted down with connection. The internet of everything has, in fact, taken away much of our freedom. So now the prospect of having to carry one more thing as one is about go out for a simple walk is yet another care, tantamount to having another chronically ill relative to worry about. The statue of Atlas holding the world on his shoulders that stands in the entrance of a Rockefeller Center office building across from St. Patrick's can be looked at as a metaphor for modern man weighted down by civilization and its life saving devices.